Find out how our Automation Engine, BOM Configurator, Cost Modeling Tool, UI Wizard, xEngine integration and xReport solutions can help your business. Guides users through questions and automates the creation of records. 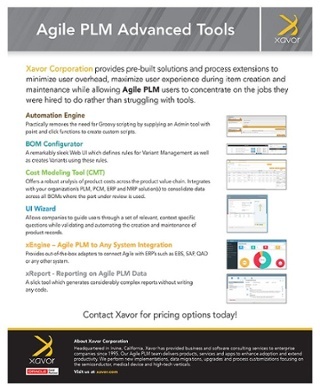 xEngine provides a basic infrastructure to connect Agile PLM with other systems. Generates considerably complex reports without writing any code.